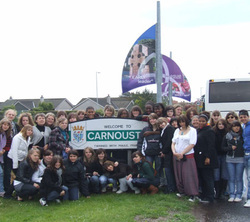 'Le BUAT' is one of the colleges in Maule and they have made a number of visits to Carnoustie in recent years. They have stayed locally during these but have also travelled to other parts of Scotland and visited for example Edinburgh and the Trossachs. They have also been to Angus College in Arbroath to get a taste of College life in Scotland. These are students in their late teens and have always shown a willingness to try something new and experience our culture. Each year different students have made up the party and their visits have been enjoyed by both them and us. While in our area the students were accommodated together in Arbroath and they have visited a number of the local attractions including the Signal Tower Museum and a 'Smoke House' to see where the famous Arboath Smokies are produced. They also took the opportunity to check out the local RNLI (lifeboat) station where as the picture shows they got right into it. Anyone needing rescued? A number of the most recent visit included a number of keen photographers and the area between Arbroath and Auchmithie proved ideal to test their photographic skills. One of the the more popular activities during the visits were cycle trips made between Carnoustie and Dundee along the banks of the River Tay. They were blessed with great weather on each occasion making the journey very pleasant. Once in Dundee there was the opportunity for shopping and see what the city of Discovery has to offer. The more energetic Cycled back to Carnoustie so who says teenagers just want to sit about? Although the students are quite conversant with Petanque, we decided to give them an insight into bowling. Now you would not have thought that teenagers would be keen on 'the old mans game' but they took to it with great enthusiasm and had a great morning and a lot of laughs. Once they understood that the delivery is totally different to that required in Petanque they were actually quite good and surprised a few of the bowlers present. We have enjoyed the Buat visits and look forward to perhaps some more in the future.